Writer/director Osgood Perkins (son of the late, immortal actor Anthony Perkins) is becoming a major name in slow-burn horror, first with his acclaimed ghost story I Am the Pretty Thing That Lives in the House and now, courtesy of A24 we get to see his previous film The Blackcoat’s Daughter (aka February), which hit fests two years ago and is now finally seeing the light of day. The Blackcoat’s Daughter is a deeply atmospheric and frightening film that centers on Kat (Kiernan Shipka) and Rose (Lucy Boynton), two girls who are left alone at their prep school Bramford over winter break when their parents mysteriously fail to pick them up. 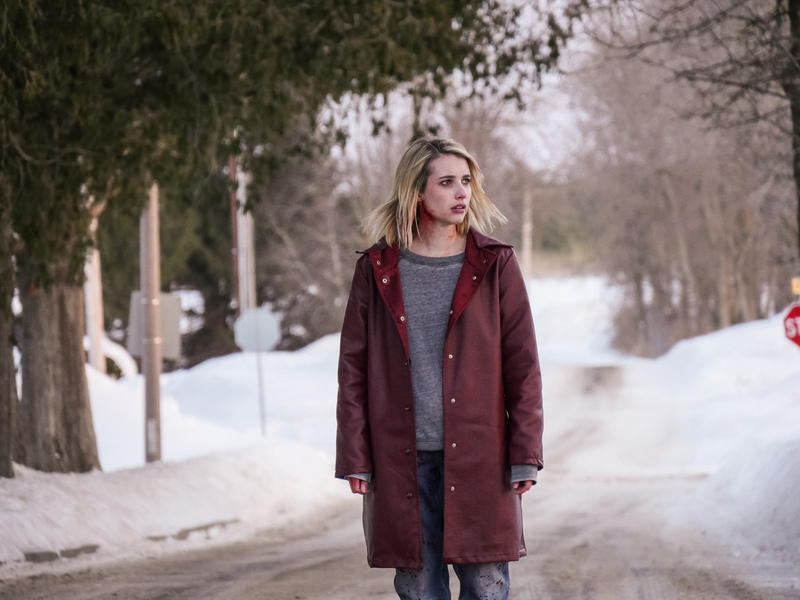 While the girls experience increasingly strange and creepy occurrences at the isolated school, we cross cut to another story—that of Joan (Emma Roberts), a troubled young woman on the road, who, for unknown reasons, is determined to get to Bramford as fast as she can. As Joan gets closer to the school, Kat becomes plagued by progressively intense and horrifying visions, with Rose doing her best to help her new friend as she slips further and further into the grasp of an unseen evil force. The movie suspensefully builds to the moment when the two stories will finally intersect, setting the stage for a shocking and unforgettable climax.